A red and white satirical poster from 1995 mocking the idea of political correctness. 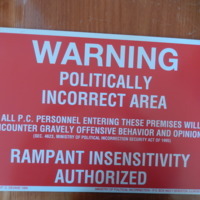 It is issued by the fictitious Ministry of Political Incorrection to convey an area off limits to those who are deemed too focused on political correctness. A satirical poster warning that an area is politically incorrect. “Politically Incorrect Area Warning Poster ,” UIS History Harvest, accessed April 18, 2019, http://uishistharv1.uis.edu/items/show/96.